Discoloration and uneven skin tone can add years to your visage—even if you’re completely line- and wrinkle-free. Although I don’t have major pigment issues, I do have one stubborn small patch about the size of a pencil eraser on my left check, which I’ve named it “Spot.” The best thing about “Spot” is that he (or she) is a great gauge for how well a skin-brightening product works. An effective serum or cream sends “Spot” into hibernation after a few weeks, but he/she always comes back if I stop using it. 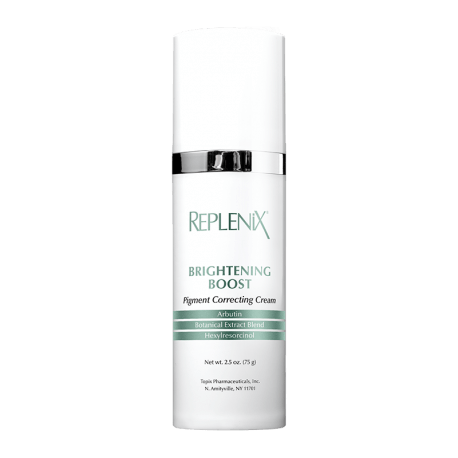 I’ve been using Replenix Brightening Boost Pigment Correcting Cream for about 10 days, and I can definitely say I’m seeing less of “Spot.” This treatment is interesting in that it’s meant to be applied both morning and night—but in different ways depending on the time of day. In the morning, I use one pump as my final step before sunscreen, and at night I apply two or three pumps immediately after my retinoid and allow it to sink in for a half-hour or so before applying other serums and creams. For any of you who may be weary of skin-brightening treatments, this one is hydroquinone-free—and relies on a potent blend of arbutin and hexylresorcinol to fade pesky pigment. It’s also formulated with a special peptide that promotes exfoliation (in turn helping your skin shed dark or damaged cells faster) and a blend of botanical extracts that provide antioxidant protection. As an added plus, it contains hydrating glycerin so I (personally) don’t need to apply moisturizer after I use it in the morning. In addition to “Spot” getting harder to see, my overall skin tone has improved as well—so much so that I’ve been able to get away with wearing just a tinted sunscreen (and no tinted moisturizer) as I go about my day. I’m still getting used to skipping that part of my makeup routine, but it’s a small price to pay for healthier, fresher-looking skin!